I noted that one of the many errors in their article was the fact that “their key evidence … on employee compensation as a share of Gross Domestic Product (GDP) …, is obtained by combining data from different datasets in a glaringly invalid way, without regard to whether the datasets are measuring the same thing.” But it turns out that what they did is even worse than I thought. indicate that they received unpublished data on compensation of private-sector employees from a different government bureau. Then, adding NIPA figures on the compensation of government employees to their unpublished private-sector figures, they obtained their alternative figures for the compensation of all employees. Obviously, this procedure is invalid; it is tantamount to adding apples to oranges from which some sections have been removed. Since their alternative compensation figures are smaller––and increasingly smaller––than the official ones, it must be the case that some private-sector workers have been left out of their unpublished data, or that the unpublished data omit some components of employee compensation that the NIPA data include, or both. But Magdoff and Foster do not seem to be concerned about this glaring problem with their total compensation numbers, if indeed they are aware of it. They don’t explain why they chose not to use the official NIPA compensation data for all employees. They don’t even tell us that such data exist, much less that they yield quite different results. But as I say, it’s even worse than I thought. Before publishing my article, I wrote to the person from whom they obtained the unpublished data (the Supervisory Economist of the Office of Productivity and Technology, Division of Major Sector Productivity, of the Bureau of Labor Statistics), and I heard back from him yesterday. Contrary to what Magdoff and Foster stated, he indicates in his reply that his office did not supply them with alternative figures on private-sector employee compensation. Instead, it supplied figures—official NIPA figures––on business-sector employee compensation. I apologize for taking what Magdoff and Foster said at face value. I should have been more critical and skeptical. What the Supervisory Economist said checks out. I have confirmed that what Magdoff and Foster call the compensation of “Private sector employees” in their Chart 1 is actually the compensation of business-sector employees (see Figure 2 below). Given Monthly Review’s longstanding penchant for confusing capitalism with private enterprise, it is perhaps not surprising that they confused business-sector compensation and private-sector compensation. However, there are two important differences between them. One difference is that business-sector compensation excludes some private-sector compensation­­––the portion received by people who work in nonprofit institutions and households, and international flows of compensation. Thus, the first of the two possible sources of error that I mentioned­­––“some private-sector workers have been left out of their unpublished data”—turns out to be the actual reason why Magdoff and Foster’s compensation share for “all” employees falls further and further below the actual NIPA-based compensation share. The other respect in which business-sector compensation differs from private-sector compensation is that some of it is governmental, not private. The business-sector data include compensation paid by government enterprises like the US Postal Service and the Tennessee Valley Authority. Now, what this means is that Magdoff and Foster double-counted compensation paid by government enterprises. When they added compensation of government employees to “private-sector” (i.e., business-sector) compensation, they were adding compensation paid by government enterprises to data that already include compensation paid by government enterprises! So what they wrongly call the compensation of “All employees” in their Chart 1 is actually compensation of “employees in the private business sector, plus employees in the general government sector, plus employees of government enterprises, plus employees of government enterprises a second time.” In other words, it’s a complete mess (see Figure 1). As I noted in my article, and as the Supervisory Economist confirmed in his reply to me, the right way to obtain compensation of all employees is simply to use the data published in the NIPAs. 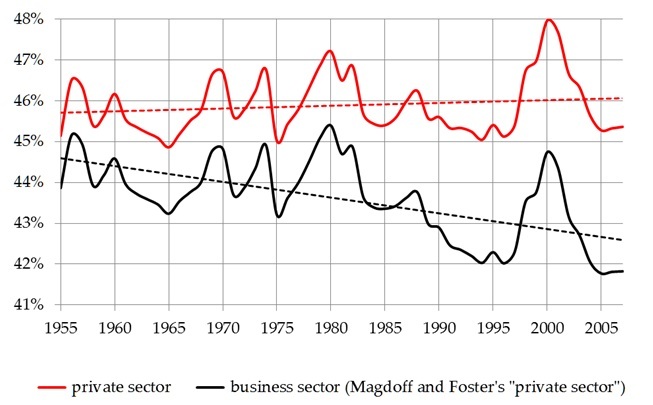 In their article, Magdoff and Foster emphasize the “fact” that compensation of private-sector employees “exhibits … a decline from the 1980s to the present” as a share of GDP. I put “fact” in quotes, because it actually isn’t true. 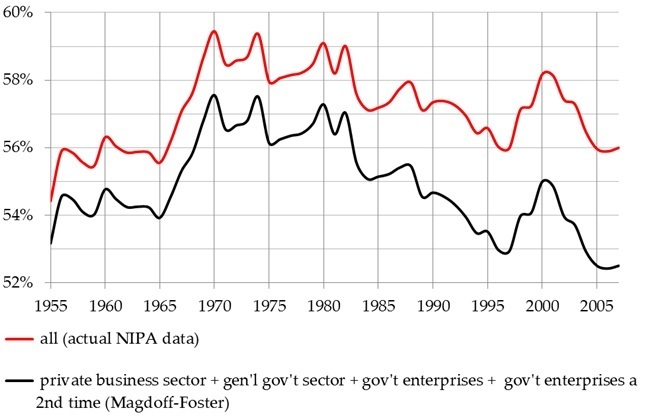 What they call the “private sector” is actually the business sector, and as Figure 2 shows, private-sector compensation did not trend downward as a share of GDP. Over the 1955-2007 period as a whole, and over the 1981-2007 subperiod, it trended slightly upward. (1) My book (The Failure of Capitalist Production), my recent article, and this follow-up to the latter reveal a consistent pattern of errors that could easily be avoided, errors that invariably work to the ideological advantage of the Monthly Review school. This is indicative of a persistent failure to review the accuracy of what’s claimed and insufficient concern for accuracy. Readers should take claims made in Monthly Review with a pillar of salt. (2) Monopoly power is not a good thing. The Monthly Review school enjoys a good deal of monopoly power on the Left. In protects its monopoly position by refusing to engage in open debate with those who challenge its claims, and by engaging in personal vilification and questioning of their motives (in my personal experience, Monthly Review associate editor Michael Yates is a main culprit). All this serves to protect its claims from being subjected to scrutiny and criticism, and this is undoubtedly a main reason why it can persist in its “relaxed” attitude toward accuracy. (3) The victims of all this are not only those who dare to challenge the claims made by the Monthly Review school. The biggest victims are the public, the quest for truth, and thus the struggle for human freedom, inasmuch as this struggle requires genuine knowledge and an informed public. I request that this comment be published in Monthly Review in order to correct the errors noted herein. Compensation of all employees is reported in NIPA Table 1.12, line 2. I obtained figures for private business-sector compensation by adding lines 4, 20, and 29 in NIPA Table 1.13; figures for compensation paid by government enterprises and the general government sector are reported in lines 37 and 57 of the same table, respectively. GDP figures come from NIPA Table 1.1.5, line 1. These tables are available at bea.gov/iTable/index_nipa.cfm. Compensation of private-sector employees is reported in NIPA Tables 6.2B–D. I obtained figures for business-sector compensation by adding lines 4 and 11 in NIPA Table 1.13. GDP figures come from NIPA Table 1.1.5, line 1. These tables are available at bea.gov/iTable/index_nipa.cfm. Congratulations on a thorough piece of debunking. 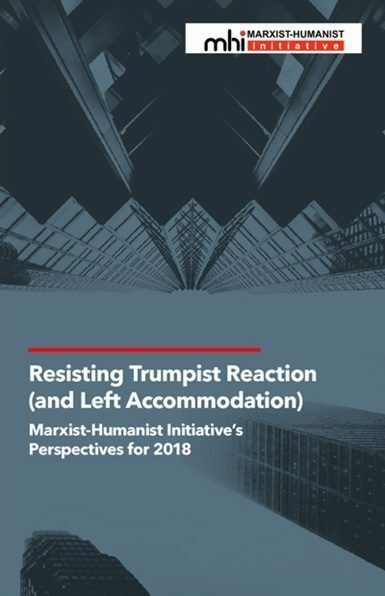 I have to say that having worked on the many errors in neoliberal and mainstream data analysis for twenty years, it is pretty dispiriting to find members of the left, who are supposed to set higher and more critical standards than the mainstream, simply reproduce their sloppiness in spades. It is indicative of a more general fact: although heterodox economics of all types defines itself as being opposed to orthodox economics, in fact it reproduces, all too frequency, the same errors. Most central to the whole endeavour is a systematic failure to understand how truth is arrived at. 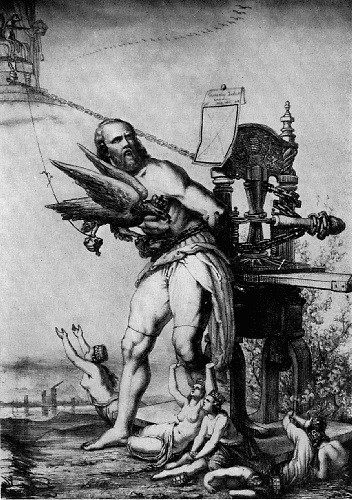 Hence: (1) heterodox writers think they have some kind of license to misinterpret or misrepresent the view that they are criticising (2) heterodox writers engage in what I call ‘institutional delegitimation’ – that is, they pay no attention to pluralism, instead excluding from comment or scrutiny any argument or idea that causes them problems (3) not least, they think that facts are some kind of accessory to rhetoric – first think of what you want to prove, then construct some facts to support it. Again, congratulations on a very thorough piece of analysis. This is amazing. Kudos to Andrew Kliman for taking the time to look into these claims. Has there been any response at all from Monthly Review to these criticisms? All I have seen is a not-so-subtle attempt to change the debate by publishing this recent two-part piece on crisis theory. This supports the need for a space to discuss Marxist crisis theory. To objectively assess competing viewpoints. One such space is the Facebook group ‘Marxist Crisis Theory’. Ultimately, any true Marxist should have realized long ago that Magdoff, Sweezy, Baran, and the Foster/Yates clique had frozen their analyses into the ice cubes of the New Deal and never planned on leaving it. It was, since their days on the periphery of the Communist Party and its “theoreticians”, the golden calf that represented their highest public acceptance and their hope of reclaiming that popularity. The next analysis should now continue on to judge the real “Marxism” of such individuals and organizations that defend such reformism and ride its coattails, dreaming of cushy jobs in a bureaucracy built to help the workers. My only hope would be for these turncoats to be chased from the stage. Thanks to Andrew, Alan Freeman, and Brendan Cooney’s work, hope can exist. Thank you all!